During 30 years of world-wide travel, Margaret has developed rapid sketching techniques - "Journaling" - which is a picture diary that allows the artist to quickly capture impressions of light, a composition and the essential magnetism of the subject in a journal. She has sketched from cars, planes, boats and floats, on trains, by horseback, skis, a hot air balloon and a raft on a white water excursion. These ideas are sometimes "just fun memories" but mostly Margaret uses them to help create her larger paintings both in watercolor and in oil when she is back in her studio. She calls them "Encyclopedias of Inspiration". She has logged over 100,000 miles of travels from San Francisco to Singapore, and Hong Kong to Egypt. Her books contain sketches of landscapes, flower markets, cafe scenes, people, alphabets from other languages, dried flowers, wine bottle labels and recipes from her travels. Her first three sketchbooks in this collection became the book "Colors of France: A Painting Pilgrimage" by Margaret Hall Hoybach and Joan Brown. Her sketches and stories tell of her trip through France to visit Monet's gardens at Giverny. It was published in 2002 by First Light Books. 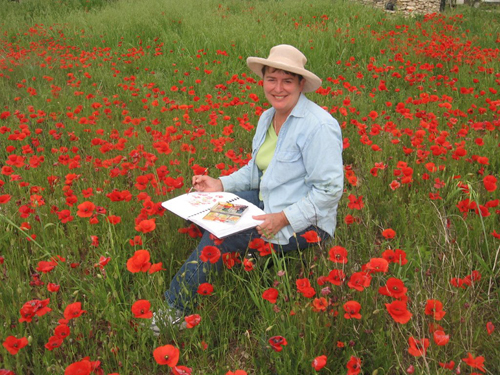 Hoybach has conducted over 100 watercolor and "journaling" workshops throughout the United States and Europe. One can "journal" using watercolor, colored pencils or markers, pen and ink, crayons, or a combination media. Each artist has their own personal style and there is no right or wrong way. She also teaches workshops in her home studio in South Carolina. 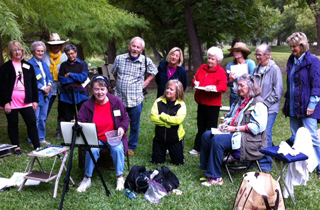 Plein aire Journaling in San Angelo, Texas. Keep up to date with Margaret's regular blog posts on Journaling by visiting this page. At different times throughout the year Margaret holds Journaling Workshops. These 2 and 3 day workshops are held either at her home or at a pre-determined studio and follow the process and instruction of creating a 'journaling book' with sketches and watercolors. If you are interested in taking a workshop, please call 1-800-469-2224 or Email: MargaretHoybach@sc.rr.com.